I have just checked the listing and this is the largest size that our suppliers make. Looking at the measurements on the photos against a ruler, it is apx 25mm including the jump ring. We do have other Chinese symbols, BUT they are all about the same size or smaller. If you would like to return it then we can refund in full. We carry about 4000-5000 items and I photograph every one of them apx 3 times against a ruler, to show the length, thickness and reverse also. Sorry it wasn’t large enough. 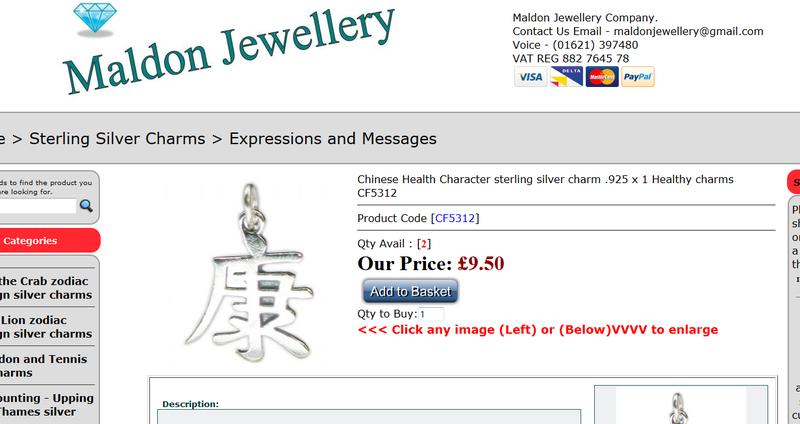 >I have just received the silver pendant item number CF5312. >I like it very much, but it is smaller than I anticipated. Do you have these Chinese symbol pendants in a bigger size?